The Servaris ProServ M2800 is the latest in a Industrial, Military and Telecom Grade NEBS Level-3 and ETSI Compliant 2U Rack Mount Server. Designed to be fire-resistant and to withstand extreme heat, humidity, altitude and zone 4 earthquake shock. Advanced server management and telco alarm management features provide visual, audible (optional) and System Network Management Protocol (SNMP) event indications of faults, consistent with the rigid requirements of the telecom central office environment. Servaris M2800 NEBS Certified Rack Server is an excellent solution for the demanding environment and limited space of the Telecom Central Office, Military Environment and high availability Data Centers for Cloud Environments and Mobile Environments. 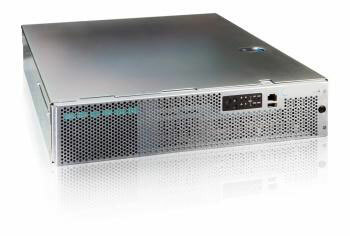 The ProServ M2800 delivers industry-leading performance-per-watt over previous-generation rack mount servers. It features the Intel Eight-Core Intel® E5-2600 Series Xeon Processors - based on Intel's latest 32nm technology - to provide breakthrough performance and energy efficiency for compute and I/O intensive applications and workloads. 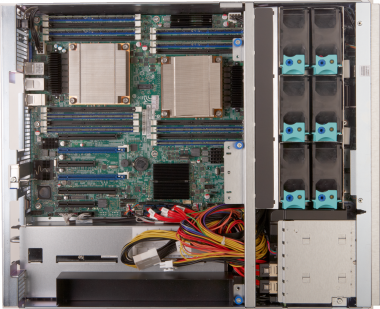 Internal Storage: Up to 6 x 2.5" SAS, SATA and SSD Drives with embedded SAS controller with RAID-0, RAID-1 or RAID-10. Network: Four Integrated Intel i350-AM 10/100/1000 NICs. Optional I/O Module for two or four additional Intel i350-AM 10/100/1000 NICs. Options for Intel Dual Port 10GbE I/O Module. Front Panel: Main Power, Critical alarm, Major alarm, Minor alarm, Power alarm, System ID, HDD activity, Drive Fault (one per drive). Switches: Power, Reset, NMI, ID. Rear Panel: Two USB Ports, DB-15 Male Serial Port, RJ45 Serial Port , Telco Alarm Connector, SAS Port for external JBOD support, optional GCM Port Connector. Memory: 12 DIMM Slots provide up to 256GB DDR3/1600Mhz E.C.C. Registered CMT Labs Certified Memory. Memory Mirroring and Memory Sparing BIOS Options. Cooling System: 4 cooling fans; two 80mm x 38mm and two 40mm x 28mm aided by two additional fans located in the power sub system. Power: Redundant Hot-Pluggable 600-Watt 0+1 P.F.C. 100-240V AC Auto-Sensing power supply or 600-Watt -48 Volt D.C. Remote Server Management: IPMI-2.0 Compliant, Lights-Out-Remote, FreeBSD, Linux, Windows, Solaris using open source software. PXE boot option, Bios and OS Console Redirection. • ETSI EN 300 386 - EMC requirements for Telecom Equip.